Sightseers at a zoo have been left totally horrified after a polar smashed its glass, sending panic around the place. Terrifying footage captured the moment two pals enjoying a day at the zoo almost became polar bear feed. The horrifying clip shows the men chatting and smiling as a massive polar bear plays underwater in front of them. Laughter can be heard in the background of the clip as the playful bear starts throwing a square rock from its enclosure around the glass tank. But seconds later, things take a sinister turn when the animal launches the rock at the glass. On the first try, the brick does nothing and the men continue to enjoy the spectacle before their eyes. But when the bear returns for one last try at freedom, he hurls the brick directly at the men’s faces. The glass in the tank smashes in a thunderous crash, leaving visible crack marks. The two terrified men jump backwards, clutching each other as onlookers off camera gasp and scream in terror. Miraculously, the glass doesn’t completely shatter, and the polar bear swims off in fright itself. 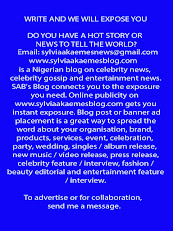 The video – filmed at Rotterdam Zoo in the Netherlands – was shot a few years back but has recently resurfaced online. 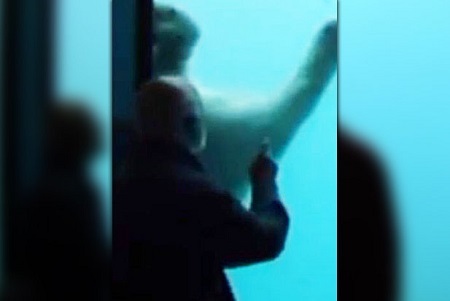 The zoo posted the clip online explaining the cheeky polar bear, named Vicks, “was not attacking the window deliberately”. It said: “This little video proves beyond any doubt that Vicks is not a ‘deliberate smasher’ of his exhibit. But it didn’t stop viewers being horrified by the scary moment. “The polar bear wants out, good for him,” added a third.